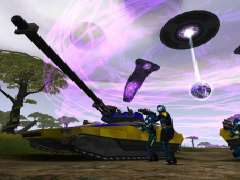 Sony Online Entertainment (SOE)'s PlanetSide has met with a lot of success since it's launch last spring. 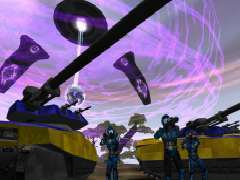 Unlike many other massively multiplayer online titles to date, Planetside is a first-person squad based shooter that focuses on action instead of traditional role playing elements. PlanetSide's first expansion pack, Core Combat has finally reached the market and instead of offering just a few new maps and weapons, CC introduces urban-style combat in small underground caverns that gives the game an entirely new feel. The many new weapons, strategies, and maps are integrated seamlessly into the main game, giving it added depth and strategic elements that add strategic elements into the game's immediate appeal. 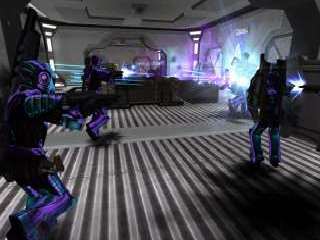 PlanetSide: Core Combat is a great expansion pack that should please owners of the main game. While many expansion packs seem content to add a few new maps, skins and weapons onto their main game, the developers of PlanetSide had much more ambitious goals in mind. Core Combat is an example of how to do this right. This expansion pack introduces an entirely new world located directly beneath the main game's playfield. The enhancements in Core Combat can also play a big role in how successful you are at battling rivals, and the new vehicles and weapons are quite powerful. However, most of the vehicles in the new game are only useful underground. The good news is that the new weapons and enhancements will definitely help your struggle overhead, as any modules you gain will help your defenses and increase your firepower as you battle your foes on the surface. Taking place below the surface of Auraxis, the main planet in the standard PlanetSide adventure, Core Combat is a massive add-on that lets you fight through and explore six new massive underground chasms. These have recently been discovered and are potentially critical artifacts that have been left behind by an ancient civilization known as the Vinu. As you explore these remains, you'll take the role of one of three rival factions as you take the battle underneath the worlds. All of them are trying to locate and secure these Modules. This alien technology is highly desirable for each faction because the incredibly powerful modules unlocked amazing abilities that allowed the Vinu to transport through the universe at will. Locating these modules and converting it to use in weaponry at your facilities is critical, because their powers grant the recipients a huge advantage in the ongoing battles on the planets' surface. In order to convert these modules into weaponry for your facilities, you first have to locate them. Once you find them, you have to place them in a stasis box. However, you can only create the Stasis boxes in Stasis Buildings inside the Core. Once you have done this, you have to transport the energy modules to the surface and bring them to your facility. At your facility, you place the Stasis Box containing the Ancient Module into a Node, which converts it to energy. While most of the Nodes are located inside your base or facilities, they can also be found outside the bases' walls from time to time as well. There are several types of these Modules, and each has a unique ability such as increasing shields. 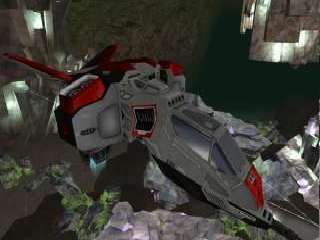 Others types allow you to buy or repair the ancient vehicles and ancient weapons. You can also use them to improve your facilities re-spawning speed, increase your forces' health and they can also enhance your firepower to maximize the amount of damage you inflict. You can bring as many of these Modules to your facility as you want, and each facility can use any or all of them simultaneously. However, the power of these modules begins to weaken as time goes on, but you can replenish this by bringing additional nodes to the facility. After you've activated the technology, you can use the warp gates on the planet's surface to transport back to any of the six subterranean caverns. As you explore the caverns, you'll encounter numerous crystal formations scattered throughout the core. Each of these crystal formations has a unique color that indicates their effect. You'll find ones that restore your health, weapon and vehicle energy and two with special powers to increase or decrease your energy. The ones that cause damage work regardless of how much armor you have, so you have to be careful around these. Using the modules allows Core Combat to implement six new types of weapons, new underground vehicles, and transports. The new weapons are quite impressive and include a heavy rifle called the Maelstrom. This has two firing modes, one that fires a stream of fire at enemies and a secondary weapon that shoots chain-energy grenades at foes. Players can also access the Radiator, which fires an indirect weapon at foes and saturates the area with radiation, damaging any soldiers that enter that area. Finally, players can use the Spiker to shoot powerful Orbs at opponents, the longer you hold these before firing, the more damage they'll inflict. There are also several new vehicles including a massive hovercraft called the Flail, which can fire Dispersion Cannons to inflict heavy damage. You can also deploy light, fast moving Switchblades into the battlefield. These forward-mounted cannons fire scythe shaped ammo at weapons. The switchblade offers 360-degree movement in Turret mode as well. Finally, players can unlock the Router, a mobile troop transport that allows for rapid movement, though its offensive abilities are somewhat limited. 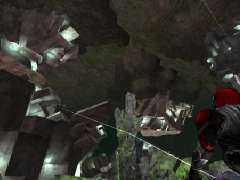 While the surface world of Auraxis is quite large and open, the caverns are much more compact and require a different kind of combat, more akin to street-to-street urban warfare. The claustrophobic Core areas offer less visibility than the surface offers and the battlefield is much smaller, making for faster and more dangerous encounters. There are more objects to worry about and the dark caverns reduced fields of vision means enemies can attack you from any direction. You'll have to be constantly aware of your surroundings and since there's not as much room for cover, you'll have to be ready for battle at any moment. This changes the strategy completely, and makes for an exciting change of pace. However, you'll still need to transport the energy modules to the surface. This allows you to see your progress in direct relation to the surface battles while helping to integrate the Core Cavern areas into the main game effectively. With the new weapons and areas, the developers have also invested a lot of time making Core Combat impressive. It's dark caverns are well-designed and make for some fairly interesting combat environments. Like the main game, players will find an impressive amount of detail in all objects in the game, with excellent character animations, special effects and weapons all rendered in outstanding detail. The visual opportunities that the underground world presents have also allowed some new elements to come into play and you'll now have to traverse everything from ice covered areas to lava rivers, adding more challenge to the experience. 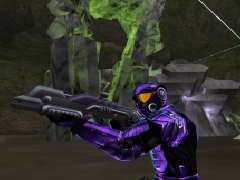 Overall, Core Combat is a visually impressive online title that offers plenty of excitement. The new areas compliment the game's epic scale, offering a completely different, yet consistent set of gaming environments that add new layers of strategy and challenge to the mix. Setting up the game and installation was quite simple and the requirements are low enough that most PC owners should have little problem getting it to run on their machines properly. As you'd expect, you need to have the main PlanetSide disc installed and set up in order to play the expansion, but you don't need to set up a new account. Since the game builds on the previous installment, you can pop in the new disc and play with your existing forces automatically. While there were a few minor glitches here and there, Core Combat game plays seamlessly online with little lag. Navigating the menus and setting up the game have remained largely the same this time out. While this is a solid expansion pack, players should expect additional features and bug fixes to come out as they warrant, and with SOE's excellent reputation for consumer support built over the years, expect few problems locating and downloading additional patches for the game. PlanetSide: Core Combat offers players great value for their dollar and the enhancements are far more than skin deep. In addition to some impressive new graphical effects, it offers some impressive new environments, weapons, and vehicles to use. However, the smaller levels and tighter combat unearth a refreshingly different style of combat that enhances the main game without feeling like a gimmick. The new weapons and vehicles are impressive and work well within the structure of the main game to enhance the experience immensely. The added complexity and tasks presents a unique set of challenges that add texture and strategy to the experience. Between its new features and gameplay mechanics, PlanetSide: Core Combat is an impressive expansion pack that owners of the main game will definitely enjoy.